SICKLE CELL AWARENESS: Why It is Important to Know the Different Types of Sickle Cell Diseases. As the Sickle Cell Awareness month comes to an end, I find it fitting to end my awareness campaign with another eye opener concerning sickle cell disease. It has been a bit challenging to put up with the plans for this awareness month but I am still glad I was able to do something. I hope we all were able to learn more about Genotypes and Natural Blood Builders. Today, we are going to learn about the various types of sickle cell diseases and why it is important we do so. I have always known I have sickle cell. 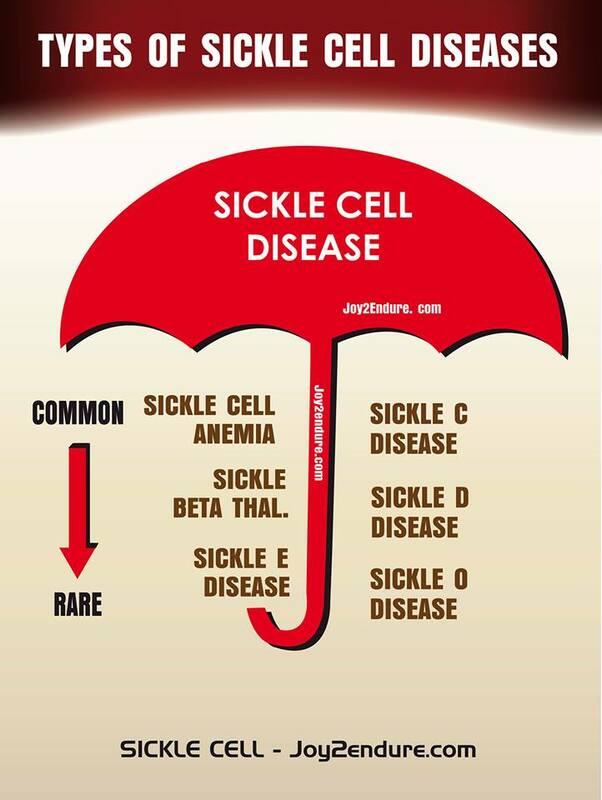 What I didn’t know was that there were actually different types of sickle cell diseases which fall under the umbrella name ‘Sickle Cell Disease’. This misunderstanding is shared by many people even those within the sickle cell community. Not until I started reading all I could about my condition did Icome to understand that Sickle Cell Anemia from which I suffer from was just one of the many different components of what builds up the sickle cell umbrella. I will try to talk about these various types as much as I can break it down in lay man terms. I will also advise everyone reading this to do as much research as possible online about the various types of sickle cell diseases. This is because not being a medic, I will not be able to explain all the medical jargons I came across during my research but which I think reading the works directly would make much sense. Just go to any search engine and type ‘Types of Sickle Cell Diseases’ and voilà, so much information at your finger tips. Those who suffer from this type inherit both S genes from their parents. It is also the most severe form of the disease with potential for serious complications in later life. This has the genotype SC which means a sufferer inherits one sickle S gene mutation and one Hbc gene mutation from each parent. The symptoms are similar to Hb SS and it is the second most common and severe form of the disease. This affects the haemoglobin in red blood cells. Sufferers inherit S gene from one parent and a thalassaemia from another parent. They are classed under blood diseases and are divided into two. The second is Sβ+ thalassaemia. They are also less common. These inherit one sickle gene S from one parent and a normal A from another parent. They are sometimes referred to as carriers and can pass it to their kids if they marry someone with similar genes. While this group are usually not sick, some have been known to manifest mild symptoms of sickle cell warrirors. Some other very rare types of the disease include; Haemoglobin SD Disease (HbSD), Haemoglobin SE Disease ( HbSE) and Haemoglobin SO Arab Disease ( HbSO). It is important to know the type you or your warrior child has because it is paramount to effective care and management; especially as attempts at finding cures are still at the experimental stage and quiet expensive to the average Joes such as the bone marrow transplant. This can be done during child hood screening before or after delivery. I suffer from Sickle Cell Anaemia (Hb SS) which happens to be the most common and most severe form of the disease. Knowing this has been effective in helping me manage my condition and also be able to enjoy as normal a life as possible. So do you know what type of Sickle Cell Disease you have warriors? Do you know what type your warrior child have parents? Find out today and strategize your battle plans well so that you or your warrior will be in the fight for a long time to come. Let’s together spread the awareness. Keep reading, keepsharing and keep commenting. We are inspired by your comments, thank you. Next From Wheelbarrows to Stalls…Why It is all About Survival. Thank you for this useful information on sickle cell types. The test usually available, especially in low resourced countries, is only able to identify sickle cell anemia (Hb SS) or sickle cell trait (Hb AS). This leaves the other rare forms mostly undiagnosed. Unfortunately those patients would receive limited attention. So this lack of knowledge is not only true for the layman but equally amongst health practitioners in poor countries. The best approach would be to screen as many newborns as possible for these conditions. Thank you very much Mr Eric. For sure limited resources makes alot of health issues a challenge in poor countries but screening as many new borns as possible will go a long way. Thank you for visiting and for the insightful contributions. Awareness and care remain our best defense. Wow!I could never possibly imagine that there were various kinds of sickle cell. Once again I learnt something new. Thanks, sis. It’s great reading your kind and encouraging words. Hopefully, many more will be able to see this too and get this side of the story. Please do come again. Glad you found valuable information here for your project. Thank you for the kind words. I am glad you found this site useful. Please do come again. whoah this blog is wonderful i love studying your articles. Keep up the great work! You already know, a lot of persons are searching around for this info, you could help them greatly. Thank you for stopping by. Please do come again.